The English call it rough puff pastry, the French ‘feuilletage minute’. A great dough to have in your baking arsenal. It rises slightly less than the more elaborate puff pastry (about 75%) but it is so quick and easy to make and the result is much tastier and fresher than the dried slices you usually find in the supermarket. The possibilities for tasty recipes with the rough puff are endless. Not just for the appelflappen (apple turnovers in English or you could call them apple pockets maybe) you’ll find in this recipe, but also for sausage rolls, cheese sticks, (also delicious with apple!) vol-au-vent’ and all kinds of pies and fruit tarts. Remember that you use good quality fresh butter for the best result and the best taste! Before you begin, put the required water in your freezer, so it is really cold when you use it. Now weigh the remaining ingredients. In a large bowl, combine the flour with the salt. Cut the butter into cubes and add to the flour. Start to incorporate the butter into the flour with your fingertips. Mix until the mixture begins to resemble bread crumb, but stop the moment there are still plenty of small lumps of butter visible. Take the ice water from the freezer and add it to the butter-flour mixture. Do not pour it in all at once, keep a bit and first check how your dough comes together. You may not need all of the water, depending on how absorbent your flour is. Start stirring with the back of a knife for example and then bring it together with your (cool) hands to form a ball. Wrap in cling film, press the ball into a disc shape and let rest in the fridge for 30 minutes. You should complete this whole process fast and without too much fumbling. The finished dough should still have visible, pea sized, lumps of butter. Take your dough out of the fridge. Now, on a lightly floured surface, roll out the dough into a rectangle of maximum 5mm thick. Then fold the dough, letter style, in thirds: first, bring the upper half to the center of the dough and then fold over the bottom half. Give the dough a quarter turn and roll out again into a rectangle. Fold again into thirds and wrap in foil and leave to rest in the fridge for another 30 minutes. Take the dough from the fridge and again roll it out into a rectangle, fold it into thirds and give it a quarter turn. Again roll out into a rectangle, this time until you have a thickness of about 3 mm. The thickness also depends on what you want to use it for. If the dough is too thick dough it perhaps will not puff as nice, especially if you use it with stuffing. Give the dough a light dusting of flour so it will unfold easier after the final rest. Now fold the dough into thirds (just so it is smaller and easier to store in your fridge). Let it rest in the fridge for 30 minutes. Your rough puff is now ready for use. You can keep the dough in the fridge for a day, I find that after more then one day it puffs up less, although it is still usable. You can also freeze it for at least 4 weeks. If you want to use it, put it in the fridge the night before. Note: For me, the amount of dough in this recipe is a nice amount to work with. Many recipes start with 500 grams of flour, so double the amount given in this recipe. I choose to make a smaller amount of fresh puff at a time. But if you want to make more in advance, just double the recipe. Before you start making the appelflappen you first have to soak the raisins. You can leave them for 15 minutes in hot water or, even better but not so authentic, you can add a splash of rum or almond liqueur. Drain and set aside. Preheat your oven at 220°C / 430°F (I use the conventional setting, not the hot air). Peel the apples, remove the core and dice them into small chunks. Mix the apple chunks with the soaked raisins, (vanilla) sugar and cinnamon. I use home made vanilla sugar (made with leftover, scraped out vanilla pods). It gives a nice subtle vanilla taste, not too overpowering. Take the sheet of puff pastry out of the fridge, unfold and cut it into 6 or eight equal squares. Put a small heap of the apple raisin mix on top of each square. Brush a bit of water on the sides of the square. Fold the sheet diagonally, so you get the shape of a triangle. Carefully press the edges and make sure they are sealed so no air can escape. You can do this with a fork and get the added bonus of a nice pattern along the edge of the pastry. Brush the top of the triangles with the whisked egg and sprinkle on some cane sugar to get that nice sugary crust. Put them in the oven for about 15 minutes. It takes 17 minutes in our oven to get the perfect result. 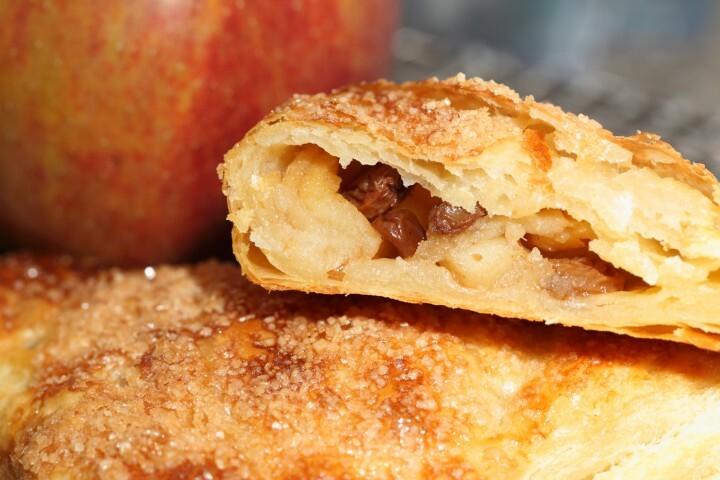 Keep a close eye on the appelflappen to check the perfect point for your oven. They should be puffed, crisp and deep golden brown when ready. Transfer them to a rack to cool (at least slightly) before eating. PS: Tell us what your favorite recipe with home made rough puff pastry is! Would you please give me the calorie count per (one) serving. I am trying to GAIN weight. We do not know exactly, but depending on how many you make with the dough it will be between 350 and 450 calories per ‘flapje’. Thanks for your helpful answer. We bought some appelflappen from the Dutch Toko and I was surprised that my Dutch husband called them oliebollen — deep fried, I gather. I much prefer oven baked and look forward to trying your recipe. I wanted to extend my praise for your site, so incredibly well done. I am really really greatful for your effort and all you share with us readers. Everything is so precise and well written that it is easy to follow. So, a HUGE thank you for making a baking life possible for me. We hope the flappen will be delicious. The challenge is really to resist the urge to work the small pieces of butter into the dough and leave them to create that lovely puff structure! Could these be frozen just at the pre-baking point? I want to bake a couple for my Dutch neighbor but thought I’d give her the rest to freeze for later. We must admit we have never done this. We have always frozen baked appelflappen and gave them a quick pick me up in the oven (first 15-30 minutest thaw and then 5 minutes in the oven at around 175 C / 350 F). We do think your suggested method could work well too, but you need to make sure the flappen will not stick together. Good luck with it and enjoy your baking and sharing! We can assure you, being Dutch, this is what a Dutch appelflap looks and tastes like. Normally they are made with full puff pastry (laminated dough) but this version uses the rough puff dough. The shape and dough of a (German/ Austrian/ Eastern European) strudel is different (more like filo dough and oblong in shape). Glad to see a new post (maybe I missed one, but haven’t seen new one for a long time) from the country with the tallest, handsomest, most beautiful young people (and old), with the best sense of humor in Europe. I hope this recipe works for me. I’m one for ten with my attempts at puff pastry and croissants. And yes, you are right, the postings have been fewer because we have been busy moving house and business twice in one year. We are getting up to steam again ‘dough’ and are already planning a few new items in the coming months that you will hopefully find useful. We zijn nog bezig met het afronden van de brioche video. Maar we gaan kijken of we hier ook nog iets leuks van kunnen maken. Dank je Mannin. het is er ook echt weer tijd voor en er zijn volop goede appels te koop, dus echt de moeite waard.